The XW-P1 may not look like a vintage tonewheel organ, but thanks to the Drawbar Organ mode, you can achieve many classic organ tones with real-time control. An organ’s drawbars provide a way to bring in various harmonics to create a sound. With some experience, and organist can recognize the physical position of the drawbars and what type of sound will be produced. On the XW-P1, the sliders act as the drawbars, and the screen shows a graphic layout of their position as well. Let’s see how they work. 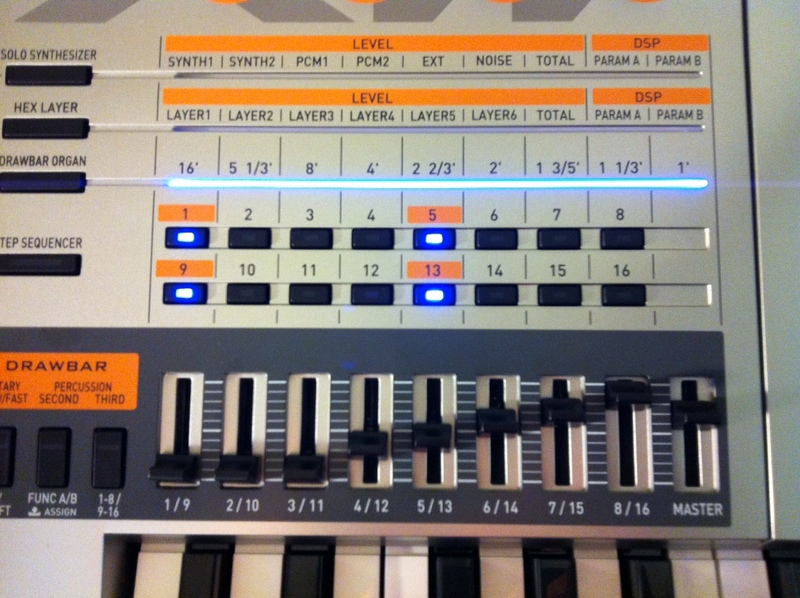 In TONE mode, select the DRAWBAR ORGAN category (the same button as “Pattern 3”). Select Preset 0-0 “Drawbar Org 1”. The right side of the screen shows the “positions” of each drawbar, regardless of the current position of the sliders. The original drawbar organs labeled their drawbars as an analogy to the lengths of pipe on a pipe organ, in feet. Each “pipe” generates a different harmonic component of the sound. Move all the sliders to the fully up position (drawbars off). Hold down Middle C (you should hear nothing. If you hear a tone, you’ve probably got percussion activated (on/off buttons are to the left of the sliders). While holding down middle C, pull the 16’ slider all the way down (drawbar fully on). You’ll hear a C. Bring the slider up, and repeat for the 8’, then the 4’, the 2’, and finally the 1’ drawbar slider. You will have heard Cs from low to high. Try the drawbar sliders labeled with fractional numbers (5 1/3’, 2 2/3’, etc). By themselves, they yield different notes (lower G, G, E, and a higher G). Since we musicians tend to think more in terms of musical intervals than the physics of the harmonic series, I think of it like this: Whole-number drawbars generate the pitch of the note I’m playing, in various octaves. Numbers with fractions generate a tone a fifth higher (also in various octaves). The exception to this is the 1 1/3″ drawbar, which generates a third (several octaves higher). With different combinations of drawbar positions, you can achieve an array of classic organ tones we’ve come to know. In Part 2 we’ll create some classic organ presets. and coming soon we’ll dig into even more organ features on the XW-P1. This entry was posted on June 12, 2012 by Tom Brislin. It was filed under Drawbar Organ, XW-P1 and was tagged with Casio, Drawbar Organ, Hammond Organ, Tom Brislin, XW-P1.